Piola is among the group of restaurants in Buenos Aires that makes genuine Italian-style pizza and that’s not surprising considering the small international chain is Italian. Here, pizza is not just a quick and cheap way to eat, but a fork-and-knife fine dining experience. From the street, the place doesn’t appear to be much, but once you enter the scale of the swanky pizza joint becomes apparent. By the bar at the front, guests are received by one of the staff. Visitors can either choose to sit at one of the front tables, the bar, or be led out the back past the DJ spinning dance beats from his turntables, and the chefs pumping out aromatic pizzas from their big wood-fire oven. An outdoor section adjoins the large room in the back for smokers, or those who just enjoy the breeze. The menu offers a good selection of wines and cocktails, as well as 40-plus standard pizza options, which can be altered to your liking. The dilemma is agreeing on which pie you want, but highlights include the Capricciosa (artichoke hearts, prosciutto and mushrooms), the spicy Messina tuna pizza, and the Gioconda with thin potato slices, and rucola (that’s rocket for you Brits). Piola is by no means just a pizza restaurant; they also offer up excellent cocktails, big salads, meat, chicken and fish dishes and a range of pastas cooked al dente in fine Italian tradition and accompanied with chewy, crust bread. Other standouts include the antipastos of varying sizes – the perfect start to your meal. The desserts include some Italian favorites — the affogato with coffee and ice cream is excellent. At Piola you will likely end up spending 50% more than many other dine-in pizza restaurants in the city (or 1000% more than the chain Ugi’s, with their pathetic cheap pizzas), but they do take credit cards. 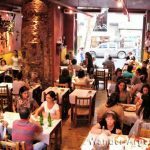 If you’re yearning for the real deal, with a funky atmosphere thrown in and some nice art on the walls, Piola’s pizza is certainly worth the extra pesos. Mon-Fri: 12:00 p.m.— 2:00 a.m. Sat & Sun: 7:00 p.m. — 2:00 a.m.